New York City is, for me, one of the best cities for the setting of a book, probably because the city itself is so alive and captivating. I know Manhattan and parts of Brooklyn well enough to be able to imagine exactly where a scene of a book is taking place, which definitely adds to the fun. 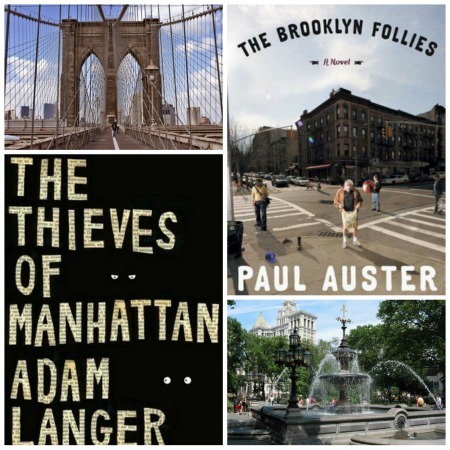 For this week's top ten Tuesday, hosted by The Broke and the Bookish, I decided to list my favorite books set in the glorious city that never sleeps. what a great spin on this weeks list! I've only read Extremely Loud & Incredibly Close, but I think it's great that you can picture many of these! That would be a fun topic! Oh I can't wait to hear your thoughts on The Brooklyn Follies! So good. Fun list -- The Krauss & the Foer are on my TBR list. Have you read Ten Thousand Saints by Eleanor Henderson or Rules of Civility by Amor Towles? They're both NYC novels that I really want to read! And speaking of The Age of Innocence, there's a book coming out this summer called The Innocents (by Francesca Segal) that's a "recasting" of Wharton's novel. It sounds really interesting! I haven't read Ten Thousands Saints yet but I do have it on my TBR wishlist. Nor have I read Rules of Civility. I haven't heard of The Innocents I will definitely look into that! It sounds promising. I love the list idea! I've read 7 of the 10 and they're such great books. I haven't seen Extremely yet either, but I can't wait to watch it. I loved the book. I got to see Nicole Krauss speak last week too! Nice that's awesome! What did she speak about? I've read 6 on your list and I couldn't agree more. I would add The Alienist by Caleb Carr. If you haven't read it yet then I highly recommend it. It's completely riveting, a real page-turner. Thanks! I'll definitely check that one out. Oooh, fun list. The History of Love and Let the Great World Spin are two absolute favorites as of late... I also read A Tree Grows in Brooklyn recently (finally) and really liked it too. Omg I still haven't read A Tree Grows in Brooklyn. I need to do that. Great list! I didn't realize The Bell Jar took place there (I've had that forever but still have to read it). I will be moving that to my NY shelf! A recent book I enjoyed is The Darlings which also takes place there. And I read The History of Love so long ago I forgot that one takes place there!! I'll look into The Darlings. Thanks! The Catcher in the Rye takes place in NYC as well. Great list! I've wanted to read Let The Great World Spin for some time now. I know I hate The Catcher in the Rye so I didn't want to put it on this list ;) I almost added Frannie and Zooey though. I'm so glad you included Let the Great World Spin. It was a problematic book for me, but there was also a very strong sense of place, and I loved the glimpse of New York when it was still seedy. There are still scenes from that that stand out quite a bit for me. I'd also add Chabon's Kavalier & Clay. That one was another book that I didn't exactly love, but I loved the depiction of New York. As for Age of Innocence, YES.